Philadelphia 76ers center Joel Embiid (21) reacts in front of Indiana Pacers center Myles Turner (33) after a score and foul during the second quarter at Wells Fargo Center. 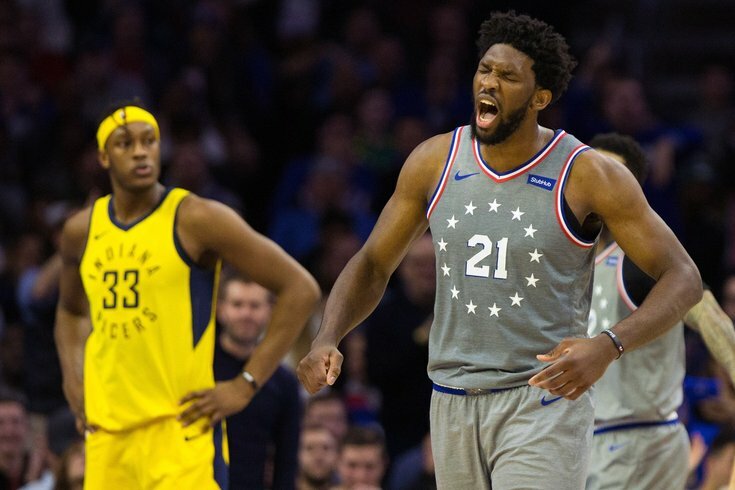 Philadelphia's win against the Indiana Pacers in early November was probably their best team performance of the season, a showcase of what they look like at their best. The loss to Indy in their most recent matchup on Friday put all their warts on display, showing that not even superstar talent can make up for a pitiful bench. Who are the real Sixers? Probably somewhere in between those two performances. Without Jimmy Butler, Joel Embiid did everything he could to try to drag the Sixers to a win on national TV. The Sixers' center had 28 points and 14 rebounds at halftime, and the Sixers looked well on their way to another statement win against a potential playoff opponent. But they simply ran out of gas. And once again, that circles back to a very obvious problem. I'm not sure how many times I'm going to have to write this, say this, or even think this. I suppose until the Sixers fix the problem. But they simply do not have enough good players on their roster right now, and it probably won't change until at least this offseason. There are too many players you have to describe with qualifiers for their strengths. Landry Shamet and Furkan Korkmaz can shoot, but they can't defend. T.J. McConnell plays hard, but he's limited defensively and gets ignored on the perimeter. Wilson Chandler is decent at multiple tasks, but worn down enough that he shouldn't be asked to do many of them that often. Even Ben Simmons comes with the huge one — he's got all the potential in the world, but he can't shoot a lick. Turns out that's a problem when you go up against good teams. You can't afford to get gashed anytime a role player has to step up, because it leaves the stars no room for error. Joel Embiid and Co. have to dominate the game in comical fashion, or the Sixers simply don't have a chance. That's not a sustainable way to run a winning team. You need to be able to get Embiid games of rest just because. You need more than three players to be theoretically capable of impacting both sides of the ball. You need a flamethrower off the bench who can get scalding hot and carry the second unit. The list goes on and on. It's very simple when you boil it down — the Sixers have a shortage of good players. When we don't have to offer disclaimers for over half the rotation, this team will really be onto something. The bad news? This problem isn't likely to be fixed this season. It's borderline impossible for Philadelphia to build depth in the middle of a season because the players you can trade in exchange for multiple players in return are all indispensable parts of the team. Maybe you get lucky with a Markelle Fultz trade because his salary can bring back a couple parts in return, but there has been no indication that he has real value around the league at the moment. Philadelphia better hope their years-long quest to preserve cap space for free agency doesn't end up a gigantic waste of time, because there are present-day consequences for this strategy. Philadelphia's franchise player is the primary victim of that strategy. The Sixers could not have asked him to do anymore in Friday's game, even though Embiid joked about that very idea after the game. "I guess next time I got to have 50 and 25," Embiid said after putting up 40 points and 21 rebounds against Indiana. "It wasn't enough, it doesn't matter what I have. At the end of the day, we didn't come up with a win." Embiid had a monster game, but Friday continued a worrying trend of Embiid dominating the first half of a game only to slow down the stretch. There were visible signs of fatigue for Embiid in the second half, most notably on the defensive end of the floor. It is very difficult for any player to carry the two-way burden Embiid does on a nightly basis, but it's especially taxing when you have to work as hard as Embiid does for his points. The obsession with Embiid brutalizing people in the post is a bit strange in this way — it's a huge contributor to his body wearing down, but certain sections of the fanbase would have you believe he should do nothing aside from stand on the low block all night. There are consequences for that. With his legs eventually giving out, Embiid was late on rotations, outmuscled for rebounds by Thaddeus Young, and ultimately unable to keep the Pacers at bay for another half. This is what happens when you don't have enough players to shoulder the responsibility. It's natural for a guy who weighs 270+ pounds to wear down over the course of a game. It's not natural to play an eight-man rotation in December where less than half of them can defend. PhillyVoice: JJ, your three-point shooting has been down. I know you've talked about before that there are ups and downs but by the end of the year you'll be at 40 percent, but is there anything in particular going wrong? Redick: Yeah, it's the catch-and-shoot stuff. I looked this up maybe a few days ago, it's historically bad. Right corner, historically bad. 3/22, I'm a 47-percent shooter there for my career. It's a little puzzling to be honest with you. Even tonight, there were three or four where you shoot them and you're like oh, that's delicious. And it turns out the bite was a little sour. It's not just Redick missing open shots out there, though Redick's misses hurt a little more because the expectations are higher. Frankly, this game should have been out of reach by halftime. Embiid was absolutely cooking in the first half, and the shooters (Redick included) missed what felt like a dozen open looks from the corners. When people discuss "killer instinct," they usually use it to refer to the fourth quarter and crunch time. But it's just as important to show that instinct in the second quarter, when you're in a position to kill off a game before the other team can get anything going. The Sixers don't often show that, and it's part of what separates them from the league's best teams. I understand the options are limited for Philadelphia right now. The Sixers probably (okay, definitely) didn't expect Markelle Fultz to banish himself to the shadow realm in the middle of the season, and even with his limitations, that took one of their versatile bench options off the table for Brett Brown. Even still, Brown's insistence on playing heavy McConnell in heavy minutes is not great. For one, it is taking the ball out of Simmons' hands, where he's actually able to impact the game on the offensive end. The second you try to turn him into an off-ball player, you're already losing some effectiveness. Simmons' usage rate in Friday's game was only a shade larger than that of Mike Muscala. That shouldn't really be possible without Butler in the lineup. The former Sixers forward spent a lot of Friday's game with Joel Embiid pestering him. Indiana is a rare team where the Sixers often feel comfortable allowing Embiid to guard their power forward(s), and it worked out for a lot of the first half. With Embiid wearing down in the second half, Young made his presence felt. Young had 15 points, six rebounds, and four assists in the second half, with four of those rebounds coming on the offensive end of the floor. He is and always was a grinder, and his activity gave the Sixers fits despite Young not having any interest in dragging Embiid out to the three-point line. He's still not much of a shooter, making him an outlier in today's NBA. But I appreciate players like Young who you can rely on to play hard night after night, play after play. He's never going to let you off the hook, and the Sixers were a victim of that mentality on Friday night.